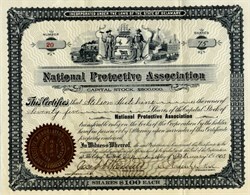 Beautiful certificate from the National Protective Association issued in 1903. This historic document has an ornate border around it with a vignette of the Delaware State Seal. This item has the hand signatures of the Company's President, and Treasurer, and is over 111 years old. the certificate was issued to and signed on the verson by Stilson Hutchins. Stilson Hutchins (1838 - 1912) was an American newspaper reporter and publisher, best known as founder of "The Washington Post". Hutchins was born in Whitefield, Coos County, New Hampshire, on 14 November 1838, the son of Stilson Eastman Hutchins and Clara Eaton Hutchins. He moved to Saint Louis, establishing the "Saint Louis Times" newspaper in 1866, and became a Missouri state representative for the Democratic Party. He subsequently moved to Washington, D.C., where he founded "The Washington Post" to advance Democratic Party views. It was first published on December 6, 1877; within a year, circulation topped 6,000 copies per day. In 1880, Hungarian-born immigrant Joseph Pulitzer joined the staff. By 1888, Hutchins cut his allegiance to the Democrats, and bought out the paper's only competitor, "The Republican National". He sold "The Post" in 1889. In 1889, Hutchins commissioned a statue of Benjamin Franklin to stand at the corner of Pennsylvania Avenue and 12th street, overlooking what were then the offices of "The Washington Post". In 1890, he commissioned a sculpture of Charles Dickens from Francis Edwin Elwell, but backed out of the deal. In 1900, Hutchins also funded Gaetano Trentanove's Daniel Webster Memorial in Scott Circle, Washington, D.C.
Later was publisher of the "Washington Times" (founded 1894 by Rep. Charles G. Conn, and later sold to Frank A. Munsey, who in turn sold it to William Randolph Hearst (1863-1951) who then sold it to Eleanor Josephine Medill Patterson ("Cissy" Patterson) who merged it with the "Washington Herald" to form the "Washington Times-Herald". Bought out by the Meyer family in 195-- who merged it with their current ownership of "The Washington Post" He died at his home in Washington, D.C., on 23 April 1912 and is buried at Rock Creek Cemetery.